Dimas Ojeda was the walk-off hero for the LumberKings in game one of a doubleheader sweep for the Clinton LumberKings on Friday night at Ashford University Field. Clinton, IA (June 22, 2018) - For the second time this season the Clinton LumberKings swept both ends of a doubleheader from the Kane County Cougars; taking game one 5-4 in eight innings and game two 5-3 in the regularly scheduled seven-inning contest. 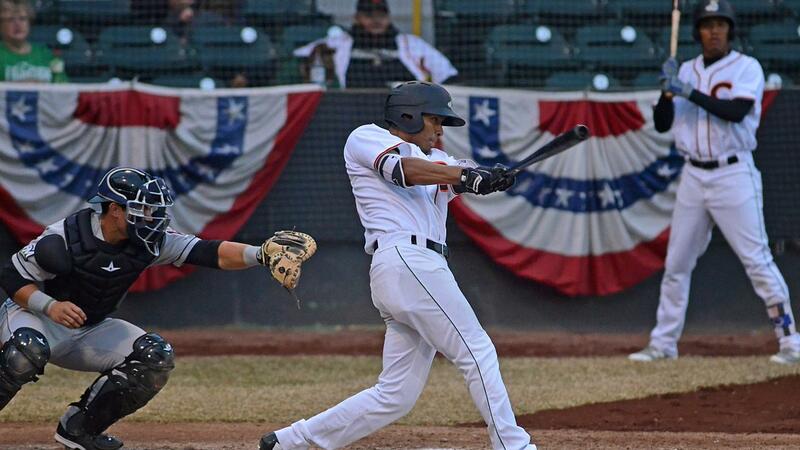 Dimas Ojeda drove home the tying and winning runs for a walk win in game one and Ryan Costello homered in the nightcap to open the LumberKings (2-0, 41-31) second half with a pair of wins. In an extra inning affair to open the twin billing the Clinton LumberKings earned a dramatic 5-4 win in eight innings. Ojeda joined teammates Zach Scott, and Ariel Sandoval as LumberKings hitters to collect two or more hits in the game. LumberKings starter Clay Chandler threw well for Clinton with a 6.2 inning outing in which he held the Cougars (0-2, 35-36) to three runs on five hits while walking one and striking out two. Still, Chandler was given a no decision after he allowed an RBI single to Eudy Ramos with the Cougars down to their final out in the top of the seventh. The LumberKings had taken a 2-1 lead into the bottom of the fifth on two-run rally that was initiated by an Ariel Sandoval RBI double and then capped by a Costello sacrifice fly to center. The Cougars tied the game in the top of the seventh on Ramos single, ending the night for Clay Chandler. Collin Kober followed out of the bullpen and allowed an RBI triple to Ryan Grotjohn to give the Cougars a 3-2 lead. In the bottom of the seventh, Clinton evened the score on a Eugene Helder sacrifice fly to center. The run was allowed by Cougars reliever Breckin Williams who was give the loss for a 1.1 inning outing in which he allowed three runs, two earned, on four hits while walking none and striking out none. After the Cougars scored their free bases runner, as per Minor League extra inning rules, in the top of the eighth off Kober (3-0) the LumberKing answered in the bottom of the inning. Keegan McGovern took second as the LumberKings free baserunner to begin the inning and moved to third on a Johnny Adams single. Ojeda then lined the fifth pitch of his at-bat with Williams (2-4) into left center field to score McGovern to tie the game and Adams all the way from first to win the game. Adams crossed the plate narrowly avoiding the tag from catcher Tim Susnara to score the game's deciding run. A play that Cougars manager Blake Lalli argued and leading to his ejection. A four-run rally by the LumberKings in the bottom of the second proved to be enough in the back end of the doubleheader as Clinton took game two 5-3. Adonis De La Cruz turned in two perfect innings of relief to earn his second win of the season. The Cougars scored the games first run in the top of the second inning. A leadoff triple by Yan Sanchez turned into a run two pitches later when Ernie De La Trinidad produced an RBI ground out that put Kane County out in front 1-0. The LumberKings answered right back in the bottom of the second to score four runs against Cougars starter Jake Winston. Eight LumberKings batters came to the plate in the inning. Juan Camacho, in his first at-bat as a LumberKing, commenced the scoring with a two-run bases loaded single into center field. Sandoval then chased home the fourth run of the inning with an RBI ground out. Ryan Costello added to the LumberKings lead in the bottom of the fifth. His team leading 13th home run of the season landed in the Lumber Lounge in right and was estimated to have traveled 380 feet. De La Cruz (2-2) quieted the game for LumberKings pitching when he came on in the fourth. Over his two innings of work he did not allow a Cougar to reach base and recorded four of his six outs with the strikeout. Kyle Wilcox picked up his fourth save of the season for Clinton with a two-inning outing in which he allowed four men to reach but struck out two including Sanchez in the top of the seventh to end the game with the tying run aboard. The LumberKings will meet the Cougars for game three of the four-game series on Saturday night. Clinton will give the ball to left-hander Ray Kerr (2-6, 4.05) while the Cougars will tap righty Brian Shaffer (2-5, 3.39). First pitch for 6:30 PM. Fans looking to listen to the call can hear Erik Oas at 6:15 PM with the pregame show on 100.3 FM WCCI. See AEGIS Credit Union for a special on tickets to Saturday night's game, and once at Ashford University Field, stick around after the game for a postgame concert from Todd Striley and the Noize!